I LIKED THE SIMPLICITY TO MOUNT THE LIGHTS ON MY DECK GIVING JUST THE PROPER LIGHT,HAD MANY COMPLEMENTS ON THE LIGHT FIXTURES SPECIALLY AT NIGHT.THE ONLY DRAWBACK IS THAT THE CLEAR PLASTIC ABOVE THE SOLAR PANEL GETS OPAQUE FROM THE SUNS UV RAYS AND THEY DON'T CHARGE THE BATTERIES ENOUGH DURING THE DAY TO KEEP THE LIGHTS ON FOR A LONG TIME AT NIGHT.IF THERE'S IS A WAY TO PREVENT THE CLEAR PLASTIC FROM OBSCURING THE SUNLIGHT BECAUSE PLASTIC GETS OPAQUE AFTER 2 YRS IT WOULD BE GREAT.I WOULD LIKE TO PURCHASE THE SAME LIGHTS AGAIN,BUT NOT IF THEY ONLY LAST A COUPLE OF YEARS. Exactly what we needed to give just enough accent light to our side yard area where our tenant enters the property. Not enough light to annoy the neighbors. Perfect for our needs. Took out of box and screwed one into the wood fence gate entry, and slipped the other three on their stakes into our metal fence pole openings. Worked like a charm. Illumination without wiring-- installed at will. I received a set of these as a wedding gift along with a set of the hanging coach lights and I love them! 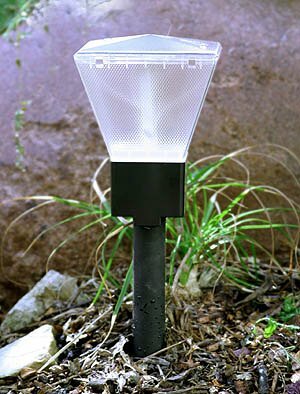 From reading the reviews other people have written on here, many people seemed disappointed...but what do you expect from a little solar-powered light? They provide just enough light to illuminate the edges of my little flower bed and patio and I actually like the fact that they are dimmer than lights powered by electricity because I really don't want my whole yard lit up at night. Besides, they are quite affordable! I bought my lanterns about a year ago...on sale for $19.99 a set and I still love them. The lanterns illuminate my walkway and garden paths just fine. I especially like the fact the lanterns are portable. They look very nice on my backyard table and I can hang them on my gazebo. Of course, they don't stay lit as long after charging on a cloudy day but just enough. 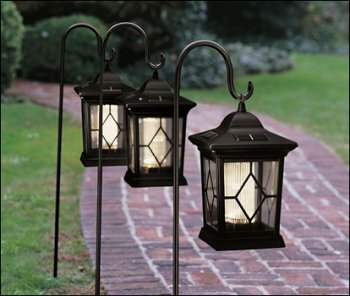 I think the lanterns are a nice purchase if you are looking for a little spot lighting in the garden. If being used to provide safety lighting for a walkway, I don't think these lanterns would be a wise choice. Pros: The light fixtures are durable, as well as the stake and hook that they reside on. These lights are a nice enhancement to the landscape - that is, during the daytime hours.... Cons: I cannot see the light fixtures at night. In the winter, with shorter daytime hours, the light fixtures last for about 1 hour after being in the sun all day. During the Summer months, with longer daylight, they do stay on until about midnight. Summary: The lights are nice looking and look great during the daytime - and during the 1st couple of hours of twilight. After that, you won't be able to see them until the sun comes up the following day. I purchased 8 of them - and they are consistently as described. It's too bad. I had high hopes! The lights LOOK really good - are very attractive... but they do not work well at all! The lights came on 1 night out of 7 -- even on 2 very sunny days - they did not work, so I can forget them working on a cloudy day. I will be sending them back for a refund! I don't understand why people are having problems with these lamps. First of all, they are not supposed to be brightly lit, but are really only accent lighting. Also, if the directions are read thoroughly, in order for the lights to work properly, they need to be in a place where they receive several hours of direct sunlight. (if they aren't lasting, just wipe off the dirt on top of the cell) For accent lighting, I think these are a very nice addition to a garden setting. They provide just enough light to set a calming mood. My family and friends admire them and I have given a few as gifts. After reading all the dissatisfied reviews, I had to let you know my experience. When I notice that a lantern won't light or that they seem dimmer than normal, I go out with a clean, damp rag and clean the solar cell! They become dusty/dirty over time and need this. If I remember, I just hose them off when watering my flowers, and this prevents the need to clean them off. I did notice the stakes are a little wimpy, but just use care when moving them. I DON'T KNOW WHY THE PREVIOUS CONSUMERS HAD TROUBLE WITH THESE LIGHTS--I HAVE FOUR OF THEM FOR THE PAST THREE YEARS AND RECENTLY ONE OF THEM HAS STOPPED WORKING WHICH I THINK MAY BE DUE TO A CRACK IN THE LANTERN WHICH WAS PROBABLY CAUSED BY A THROWN STONE FROM THE LAWN MOWER. EVEN IN THE DEAD OF WINTER WHEN THE SUN IS NOT AS STRONG THEY WILL LIGHT. I AGREE THAT THE RODS AND PIECE THAT GOES INTO THE GROUND IS NOT AS STRONG AS THE LANTERN DUE TO IT BEING PLASTIC--BUT YOU HAVE TO TAKE YOUR TIME AND BE CAREFUL. I LOVE THEM!!! They discourage me in regards the reliability of other solar powered lights. I have had the exact same problems as the other two reviews had, but I also was not very happy at the fact that when they did stay lit they didn't light up brightly. I am thinking about buying some different lights, but I think I will do some serious inquiring beforehand, and buy maybe only one to see how they work before I get any others in that brand. These things are too expensive to not work good....if they work well then the "expensiveness" becomes not so expensive and worth the price. Affordable way to add light and beauty to your garden or walkway. No wiring, safe and easy to install. These lights work great right out of the box. Their soft amber glow is a delight at dusk. They do not really light up a pathway, but rather provide a soft ambience to the immediate area. They are powered by Ni-Cad batteries that are only replaceable from the manufacturer for around $10. They should last around 1 1/2 to 2 years according to my experience. ...that these lights won't do for most people. 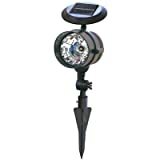 I am in charge of replacing all the garden lights in my complex with solar ones, and so have been testing almost all solar lights in this price range (between $12-25 each). I purchased 16 of these lights and tested them over a week. Some were in direct sunlight, some weren't. The results are in, and it doesn't look good.<br /> I've found that the main ticket to decent solar lighting in this price range is having 3 volts worth of batteries, not 1.5. In the case of "AA-powered" lights, like these, that means 2 AA batteries. LEDs run off 3 volts, so the circuitry for lights with just 1 AA has to convert to 3 volts, really reducing run time and brightness.<br /> The best things about these specific lights are: 1) they are plastic, therefore no rusting, and 2) the AA battery is easy to replace. Any Ni-Cad battery will do - They came with 700mAh batteries which is better than most. The stands, though sectional, are better than others I tested, though not the best.<br /> My final thought: I've had much better luck, brightness and run-time with the lights I tested with 2 AAs vs. 1. Unless you want to step up to the $50/each range, I would stay away from this set and grab one that's a little more robust, though slightly more pricey. Oh, one more thing: I've pretty much found that solar lighting kits in this range that tout "2 LEDs" instead of just one are mostly gimmicks: There might be 2 LEDs, but they are each 1/2 the size of the 1 LED you normally find. these are great. i bought my first pair three years ago. they continue to work and look good. they don't make a really bright light but you can light the walkway or path with them. they serve as a beacon. they are well made and i have really enjoyed them. every year i buy a couple more. best part is the battery can be replaced if it gets tired. I have 9 lights and 3 no longer light--even with new, recharged Ni-Cad solar light batteries. (They'll light for a few hours and then nothing until I bring in the batteries to charge them in a charger.) During the past 2 1/2 years, I've probably exchanged lights 6 times. I'm so fed up with these!